Around 24 charging points will be installed in 6 buildings. SP Group will provide high-speed electric vehicles (EV) charging points in Ascendas Singbridge Group’s buildings through a newly-inked partnership, an announcement revealed. As SP’s first major location partner for its EV charging network, Ascendas-Singbridge Group has kicked off the installation of 24 high-speed charging points for EVs in six of its buildings. These charging points are part of SP’s first wave of 38 charging points, including high-powered 50kW direct current (DC) chargers that can fully charge a car in 30 minutes. 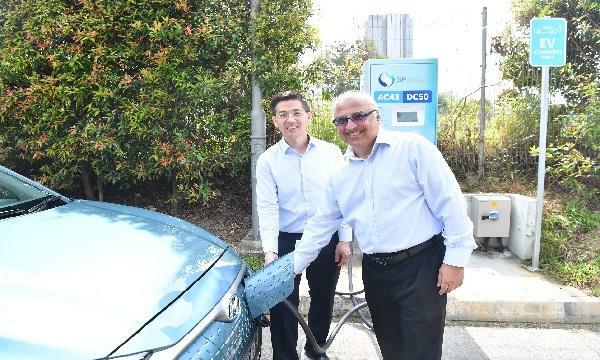 “We hope to play our part in creating a more sustainable environment by being a part of Singapore’s largest public charging Electric Vehicle network of the future,” Manohar Khiatani, Deputy Group CEO of Ascendas-Singbridge Group, said. SP had earlier revealed in 2018 that it eyes to build 1,000 charging points in Singapore by 2020. They have unveiled plans in 2018 to build Singapore’s largest and fastest public EV charging network. Through their partnership, more high-speed charging points will be installed at buildings managed by Ascendas-Singbridge Group in 2019. EV drivers can tap on SP Group’s charging service through the SP Utilities mobile application, where they can search for the nearest charging points, receive updates on their charging sessions and make payment. “This [partnership] provides more convenient locations for our charging services, and will accelerate the adoption of green mobility in Singapore,” Wong Kim Yin, Group Chief Executive Officer of SP Group commented. The newly installed charging points are located in the properties owned by Ascendas-Singbridge Group in 80 Bendemeer Road (Hyflux Innovation Centre), Corporation Place, Techlink, Techplace I, The Capricorn and The Kendall. According to an announcement, the charging points progressively started their operations since December 2018.